to be a new warehouse concept based on the Pcdata ‘Distrib’ WMS platform utilising the latest Put-to-Light technology. The result of this deployment was a productivity growth of over 20%, significant space savings, a marked reduction in errors and of course, full registration of crate contents. Prior to the implementation, Distrivers was not stranger to Pcdata solutions. 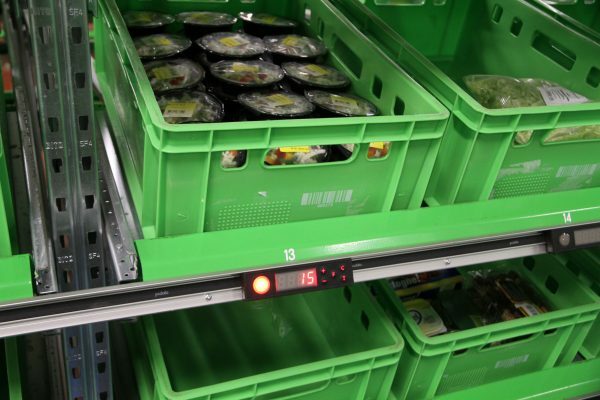 Since 2003 the Hoogeveen based wholesaler had been utilising Put-to-Light (PTL) technology to provide daily order assembly for hundreds of hospitals and nursing homes with daily food and beverage. On a daily basis fresh produce and rea-dy meals are delivered to the Distrivers distribution centre and dispatched on the same day to all customer locations across the Netherlands. Each customer location is connected to a Put-to-Light display which is then used to show the amount required of each product for each customer. Since 2003 the original PTL system of 288 light displays has been outgrown, with a greater number of individual delivery locations being served. This growth was not simply driven by an increase in customers, but also by customer demand to split orders down into smaller segments. Many hospitals and care institutions now have multi-ple departments with their own distinct catering facilities, meaning that orders have to be broken down and delivered to each individual kitchen or depart-ment area. The effect of this means that where once there may have been one large order, there are now up to 20 smaller orders. In addition to this chan-ge of order demand, there was also no real method of tracking the content of each crate being delivered to these locations. The result of these changes meant that there was a significant issue with space, an increase in mistakes, a lack of efficiency and a failure to be able to properly track & trace product to customer. “To serve all customers we had to work in two dispatching waves. Customers ordering only three crates occupied a complete floor location”, tells Sietse Buutkamp, operations Manager of Dist-rivers. “Some employees were walking nearly 10 kilometers a day along all put-to-light locations”, tells Richard Blauw-wiekel, operations Manager assistant of Distrivers. Two years ago, Distrivers decided to look for a solution to this ever increasing chal-lenge. Buutkamp and Blauwwiekel inves-tigated the possibilities of deploying other mechanization and automation solutions but finally returned to Pcdata, supplier of the original PTL system. Using sophisticated methods of analy-sis, Pcdata developed a completely new warehouse concept, based on the Dist-rib WMS solution in combination with the latest PTL technology. “We knew that what we had was good in principle. A key advantage of using put-to-light again was that the employees were already familiar with the system and did not need any training. It is also a very easy process for new staff to learn”, tells Buutkamp. The new concept has split the order as-sembly process into two phases: Pre-Despatch and End-Despatch. All inco-ming products are first Pre-Despatched to 12 End-Despatch locations. Each End-Despatch location contains a number of customer orders. 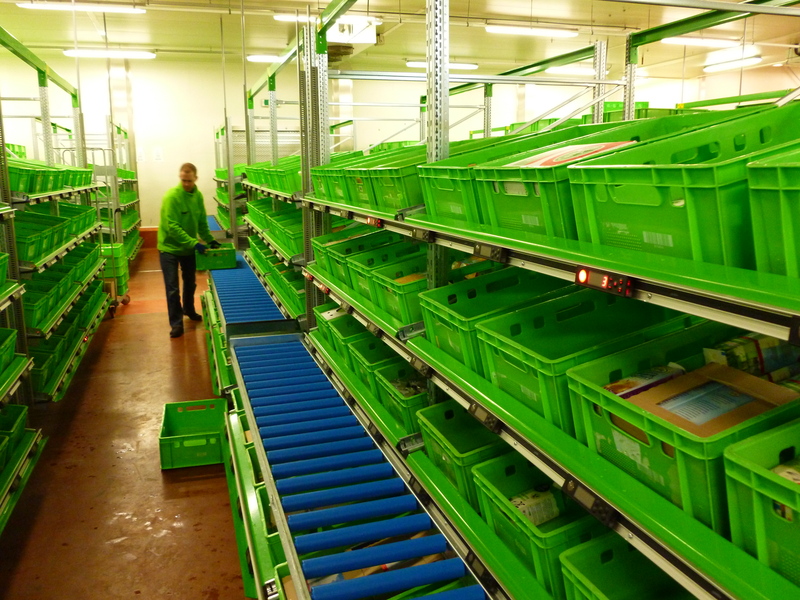 At the point of Pre-Des-patch, the total number of single units for customers in each End-Despatch zone are put into trays, separating off the full crate volume at source. Each End-Despatch zone then has a set of flow racking consisting of 64 customer locations where the single units can be assembled to orders. The full crates, having already being separated in the first phase, can be immediately labelled, taken to the outbound shipping area and marshalled ready for despatch. 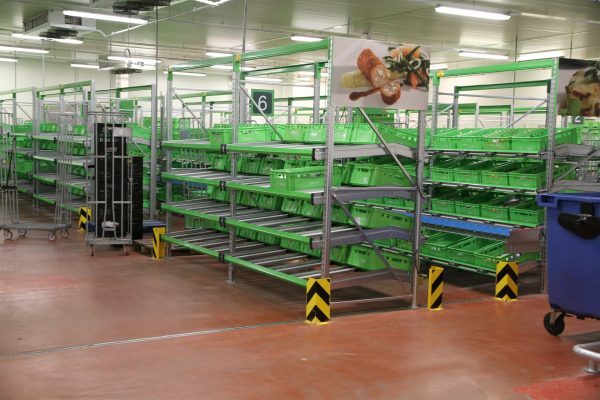 70% of the total daily volume is in full crates, meaning that all these crates bypass the order assembly process altoge-ther: “This results in a tremendous reduction in work load at the end dispatch terminals”, said Blauwwiekel. The daily operation at Distrivers starts each day at 0530 with the Pre-Despatching of in-bound products. However, it is not until 1500 when all final confirmed orders are received for all customers. This means that there is a sharp peak in order assembly activity between 1500 and 2100 as order assembly must happen during a period of when a large amount of product is also being received. At each Pre and End dispatch terminal barcode scanning is utilized to increase the speed of product intake but also to keep the possibility of error to an absolute minimum. After a product has been scanned, the terminal selects the correct product automatically and the displays of the customers who ordered this product will light up. In the previous PTL sys-tem operatives had to manually select the products on the workstation. A large number of products had very similar descriptions and looked physically very alike (perhaps only with a difference in weight or case size), mistakes were very easily made. During the End-Despatch process, the Pcdata Distrib WMS automatically records each product as it is put into a crate. As each crate is filled, the operative prints a barcode label at the touch of a button, which describes the whole content of the crate. This process links the crate content with the outer barcode of the crate, thus creating the perfect T&T solution. With this method, Distrivers is not only able to track and trace at crate level, but can also offer significant advantages for their end customers. “The customers no longer have to search in three trolleys full of crates to find a certain product. Only by looking at the label they now know what is in the crates. This saves them time and labour during the receipt process”, says Blauwwiekel. After dealing with the dispatch process, Distrivers would now like to enhance their ope-ration by improving the outbound consolidation process. Currently all crates coming from the End-Despatch terminals have to be combined with the full crates coming directly from the Pre-Despatch terminals. “Our next step is to implement Pcdata’s Distrib Dock Mana-ger Module. With that application we are able to connect crates and trolleys via barcode scanning not only to customers, but also to trucks. Then we will also know for sure that the correct products are in the correct truck giving us full end to end visibility”, tells Buutkamp. In addition to these enhancements Distrivers now also have the track & trace capability that they were so desperately trying to achieve – each crate that leaves their operation is now fully labeled and barcoded, traceable to single crate level. Since implementation of the new despatch concept, there is no longer a requirement to expand the physical dimensions of the warehouse: “At first we had 288 put-to-light locations in a space of 600 square meters. We now have 768 locations within 400 square meters! The operation once again fits in the warehouse”, says Buutkamp. But it is not merely the lack of space which has been resolved – there has also been a significant increase in productivity. Operative walking distances have been reduced to an absolute minimum meaning that Distrivers saves over 300 man hours per week on the order assembly process. “This equates to a reduction of 20%. Good resource planning is still required of course – our goal is it to ensure the End-Despatchers have a continuous supply of work. If they are ahead of the Pre-Despatchers, this has a negative impact on the efficiency”, says Buutkamp, who also expects that final delivery reliability will reach 99,9%. “Because we know each other so well, we can react to the demands of the project quickly. Just half a year after the start of the project the startup of the system took place. 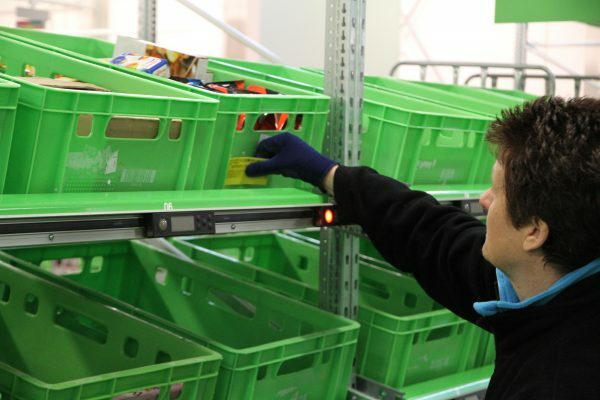 The complete relayout of the warehouse has been executed in just one weekend – any faster would not have been possible! This can only be achieved with reliable partners”.